At Naturalmat, we don’t just make mattresses. 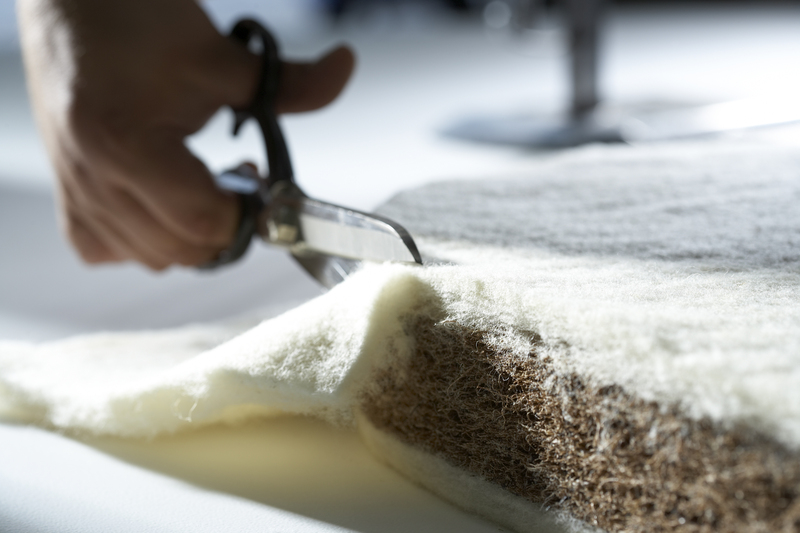 Since 2001 we have been handmaking the very best natural fibre and organic mattresses and beds in the heart of scenic Devon, where we source the organic wool that goes into all our products. We craft sustainable and renewable raw materials into a luxuriously comfortable sleep experience—one that we are proud to create for leading hotels, resorts, yachts and residences around the world, whose guests all take delight in waking up from a natural night’s sleep. Newton Paisley undertakes a variety of bespoke projects for private clients and boutique hotels, specialising in celebrating the wild species native to various sites. Newton Paisley was awarded three top accolades at the 2018 ICFF at Design x New York: Best in Show for Wall coverings from the IFDA and ICFF and Top Picks from the show from Architectural Digest. Nico designs contemporary bespoke furniture. All pieces are handmade to exemplary standards of craftsmanship, with a design ethos of clarity and attention to detail. New for 2018 will be shown a desk in fumed oak veneer with boxwood inlay on edges, and a small console table in pitted bronze finish. Niki Jones combines different cultural references within her designs with a love of traditional technique, natural materials and colour: creating a distinctive collection of unique textiles and rugs. Michael Northcroft are designers and makers of luxury furniture with an international reputation for excellence. We create outstanding pieces in our East London workshops which can be discovered in our showroom located near London’s Olympic Park. Our designs feature a wide range of exclusive finishes, bespoke sizes, and skilful craftsmanship. The versatility of our collections make it easy to find a personal statement piece for any space. We are designers, craftsmen, architects, metalworkers, artists, welders, makers and engineers. We forge bespoke objects and environments, providing exceptional pieces to some of the world's most distinguished clients. Our craft is born of industry, of the manufacturing heritage of our home, the North East of England. Special spaces deserve exceptional light fittings: lovingly designed, handcrafted, and beautifully constructed. Lighting that blends in seamlessly with its surroundings but stands out as a work of art. At Nulty Bespoke, we create lighting pieces that do just that. With our experience of luminaire design, our knowledge of materials, and our in-depth understanding of manufacturing processes, we provide bespoke lighting solutions of the utmost quality. Objet Luxe create beautiful unique objects for the home using combinations of natural materials – shells, shagreen,bone, antler, horn and exotic hardwoods – with hand crafted precious and semi precious metals. A world leader in the design and manufacture of marine blinds, shades and soft furnishings, since 1990, Oceanair has been taking and delivering on some of the most creative and challenging briefs. We do this by blending together the most elegant of fabrics with precision, innovative and elegant engineering. Our designers’ attention to detail and close working relationships with clients, help to deliver truly luxurious interiors, flawlessly finished and installed, anywhere in the world. Now, honing the expertise developed across the oceans of the world, Oceanair brings the same blend of skills, experiences and exceptional customer service to other markets - Luxury homes, Commercial properties and Recreational vehicles. The Officine Gullo kitchens are created in balance between tradition and modernity. Every kitchen is equipped with avant-garde technology, inserted inside structures that have inherited the ancient artisanal tradition of metalworking. The beauty of our city that we are so lucky to live in is the element that allows us to mix together these two souls of our production: technology and style. The wonders of this land that inspires so many people every day, guide our magination every time that we start a project. The perfect geometries hidden in the facades of ancient buildings, in the frescoes, sculptures, artisanship are our models as we forge the metals of our creations. Nothing would have been possible without Florence. Omexco is an editor, manufacturer and worldwide trendsetter of high-end wallcoverings founded by Bob Rans in 1976. Being a master in combining materials and structures, Omexco specializes in sophisticated printing and embossing techniques. We are one of the few remaining wallcovering editors manufacturing our own collections. Thanks to this, our wallcoverings can be controlled continuously, from raw material to finished product to guarantee flawless products. We are proud to be an environmentally friendly company. We always opt for products with a non-harmful base (water based colours and natural based coatings). We use recycled fibres as much as possible and we favour renewable energy thanks to solar panels. All these efforts allowed us to obtain the Ecological Label as well as the FSC® certificate for sustainable forestry. oOumm is French brand of luxury design pieces and fragrance of exception. Orac Decor is the leading European manufacturer of innovative 3D elements, specialising in high-quality coving, mouldings & ornaments. Our extensive collections range from stylish skirting, panel and cornice mouldings to indirect lighting, architraves, pilasters & rosettes. All decorative elements are durable, lightweight & simple to install making any project or revamp easier to finish. With Orac Decor products you can transform every space into something unique, without any creative limitations. Combining oriental embroidery craft with western sensibilities, luxury interiors brand, Ori Bespoke to showcase at Decorex International 2018. Specialists in fine silk Su embroidery, and appearing for the first time at the acclaimed interiors fair, Ori Bespoke will be launching their first range of table lamps, alongside displaying their collection of fine embroidery designs. Original Book Works is the source for the worlds most beautiful faux books. All created in our Cotswolds workshops by Master craftsmen. All books are made and painted by hand and we work closely with all our clients to create stunning projects around the world. Ornythos is an Italian Brand, founded in Sicily by Salvatore Longo, musician and artisan. He designs and develops luxury furniture and interior lighting for non conventional people. Overmantels has been designing and handcrafting mirrors in England for almost 30 years, earning a reputation as Britain’s foremost TV mirror & mirror specialists. We are renowned above all for our meticulous reproductions of 18th and 19th Century English and French mirrors styles but our contemporary interpretations are also greatly admired. The quality of our work ensures Overmantels mirrors are long-term pieces in their truest sense – valued antiques of the future. Paint & Paper Library was founded over twenty years ago in London by Interior Designer David Oliver. We offer a distinguished palette of 180 unique colours. Our paint is manufactured to exceptionally high standards in the UK and has been officially accredited by RIBA, the Royal Institute of British Architects. Found in some of the most prestigious properties around the world, Paint & Paper Library paints are credited with creating an unrivalled balance of colour, mood and light in contemporary interiors. Available in five finishes for both interior and exterior use, we have formulated our paints to the highest possible standard. Complementing our curated paint palette is the new wallpaper collection ‘Tresco’ which has been compiled by our team of colourists. Encompassing a mixture of traditional and digital printing techniques, the new wallpaper collection features eight unique designs printed in a multitude of colourways taken from the existing Paint & Paper Library colour palette. Parker and Jules - a collaboration of two designers; Parker a fashion industry insider and queen of print, Jules an interior designer fascinated by the history of interiors and the evolution of English style. Passionate about the power of colour and pattern to transform homes, they have worked together to produce a collection which coordinates in several ways over distinct colour stories and collection themes. Each pattern can be layered with several others within the range and they have been designed to complement each other, thereby providing clients with a complete interior design solution. Launched in January, this will be the brand's first year at Decorex. Pigmentti are an artisan decoration company, with studios in Italy and Ireland. Founded by artists Paolo Bello and Noel Donnellan, the unique duo has 50+ years hands-on experience, and work with clients in Europe and around the world. Pigmentti specialise in natural pigments, frescos, painted decoration, murals, gold leaf, verre églomisé and bas-relief Marmorino and use traditional skills in artisan crafts to work with contemporary and historical design. In a Decorex first, the unique partners will be seen live for the first time together, as part of the In The Making feature area. Skilled craftsmen Paolo Bello and Noel Donnellan will be creating a uniquely designed display piece demonstrating bas-relief Marmorino and gold leaf, offering visitors a rare opportunity to witness these highly skilled techniques first-hand. We believe in beautifully considered design. PIPÉT is a London based design label founded by pattern designer Gina Pipét. Through our collections of Interior Fabrics and Accessories we revel in Print, Colour and Pattern. We delight in the hand made and support local manufacturing and heritage craft in all our products. Custom printed in the UK, our high quality fabrics are set to become the go-to choice for interior design professionals, specifiers and retail buyers that specialise in fine residential projects. This September we are pleased to announce the launch our new 2018/19 fabric collection 'Mother's Nature' as part of the London Design Festival. Fireplaces Customized to your needs. Over the years, Planika has gained wide expertise in modern fire solutions and today we are making the most advanced fireplaces in the world. In the beginning, our flagship product was an ethanol fireplace. Now we offer two approaches to achieve the same natural fire, both gas and ethanol. All of our solutions is based on automatic features, unique design and the most natural golden flames. Our mission is to provide innovative and revolutionary technologies necessary to ensure great comfort of use and maximum safety. Explore our offer and choose your perfect fireplace. PLANT.Collections is headed by internationally renowned designer and entrepreneur Linda Plant. Spotting a gap in the market for affordable luxury furniture, her passion for design and the increased demand for bespoke furniture has inspired Linda to develop her own range. Many items are based on individual original mid-century classics, which have been given a modern design twist. The result is quality furniture at reasonable prices, without compromising on style or materials. Offering a well-appointed collection, each piece is handcrafted and beautifully made with great attention to detail. The signature look is defined by a sense of contemporary elegance and understated luxury intended to enhance and complement any interior. We suggest the best fabrics to meet and satisfy the needs of the most sophisticated customers. We design and produce finished tailor-made items thanks to our interior tailors, using our exclusive fabrics. As a manufacturer of high-end bathroom accessories since 1961 in Portugal, from where we export our products for demanding markets all over the world, POMBO is a domestic manufacture company, which develops all its creations internally. We offer a wide range of products, mainly due to the flexibility and variety of the equipment available. Besides POMBO’s collections, which includes towel rails, hooks, among other pieces, entirely produced in brass, aimed at the medium, medium-high and luxury market segments, the company offers the possibility of custom-made pieces, always envisioned, designed and produced by talented people, with love. POMBO has always understood and promoted design as a distinctive element in its products, creating accessories through this brand of excellence. A rigorous selection of raw materials, modern production equipment, careful production control, strict environmental concern and a talented team, guarantee the quality through which our products are recognized. Every region of Italy has its own traditional cottage industry. And for over 400 years, ours has been painting and decoration for the finest homes, villas and palaces in the world. All by hand. Porte Italia Interiors, fine painted interiors from Venice to the world. … and step through the gateway to inspired interiors. By offering a style-packed diversity of fabrics for curtains, blinds, upholstery and accessories - not to mention a range of truly stunning wallpapers - Prestigious can always be relied upon to come up with enticing new ideas for home interiors. That’s new ideas for everywhere from living areas and dining rooms to hallways, kitchens and even bedrooms for all ages. Textiles are the cornerstone of Prestigious’ operations, so it comes as no surprise to find the company’s fabric collections at the heart of homes everywhere. Inspirational and aspirational, these exclusive designs allow interior décor trends to be expressed through a tantalising variety of prints and plains, weaves and velvets, embroideries and metallics, all augmented by the treasures of the PT Extra portfolio. Prêt À Vivre has been transforming windows since 1995, uniquely offering 5 London showrooms displaying our made to measure curtains and blinds crafted from our exclusive range of fabrics. We are committed to offering an efficient and personalised service on all projects, from single rooms to blocks of luxury flats. We are official suppliers of Somfy motors and accessories; we offer motorised tracks for curtains and blinds and can integrate these into any home automation system. We liaise directly with your architects, electricians and automation specialists and our fitters will program at installation. QMotion UK offer a range of luxury, quiet-running motorised blinds - battery or mains powered. This year we are showcasing our new ROMAN Blind - this battery powered motorised system broadens the aesthetic choice for high end interior design schemes. Perfect for retrofit projects without the need for employing electricians. The system is available with a maximum width of 3000mm x 2400mm drop and carrying a max fabric weight of 5kg. Our blinds can be controlled via remote control all the way through to complex home control systems. This includes control via Amazon Echo Plus where no bridge is required. Also launching is the new range of 120 fabrics especially selected for their transparency, structure and width availability. A free fabric sampling service is available. Alternatively supply us with customer own fabric for mounting onto our hardware. Fabric covers can be easily changed to complement the changing of decor tastes. Quintessa Art is a unique studio and International consultancy which offers highly specialist bespoke painting, prints, framing, and textural wall sculptures. With over 30 years experience, Quintessa has worked with some of the leading interior design practices in the UK and Internationally. Its client portfolio is full of high-end luxury residential and commercial projects. From Superyachts, to boutique hotels or private residences, and from the contemporary to the traditional, Quintessa's team of in-house artists, master framers, gilders and technicians offer a truly bespoke service. From one-off pieces to much larger procurement projects, it has experience of creating original design suggestions for clients, and then producing them at the very highest level. With a vast amount of knowledge on complex shipping and installation issues, it works with a longstanding network of established partners to ensure international and local project timelines are always met. A creative craft and design practice producing one-off, limited edition, batch production and commissioned designs in silver and base metal. Sales are direct to the public through trade fairs such as Goldsmiths' Fair and Collect, from studio and workshop premises in London and through exhibition in UK galleries and museums. The business was established in 1990. Rebecca de Quin operates as a designer maker and is a sole trader. Reiko Kaneko Ltd is a company designing fine bone china in elegant, functional shapes; glassware and terracotta that is beautifully thin and light; and pure white china dipped in rich glazes to produce unique studio pieces. It’s been an interesting journey so far. After studying design at Central Saint Martins, Reiko started out designing a range of products which she had made around the world but it was the joy of working with ceramicists in The Potteries, and tapping into over two centuries of knowledge in fine bone china production that led her to concentrate on ceramics. Reiko spent her childhood in Japan and still makes frequent visits. Japan has not only been an inspiration for the elegant simplicity to which she strives, but the key to her appreciation of craft and craftsmanship. Reiko has collaborated with makers in different materials both in England and in Japan. In addition to design work, the company specialises in ceramic glazing and experiments in the studio with new reactive glazes. Bespoke furniture, grown, designed and made in London. It is increasingly hard to discern the connection between the products we buy and how and where they are made. Robert Brain makes modern British furniture using timber from London trees, designed and built in his London workshop. Sourcing material locally means Robert can trace a piece back to the street or park where the tree stood. This gives his work distinctive provenance, and instills it with a narrative of the material’s journey. Understanding the material’s origin helps to reveal its connection with the process and the finished piece, allowing clients to add deeper interest to their interiors with furniture with a compelling story. Combining his background as a Philosophy graduate with over a decade’s experience in the luxury interiors market, Robert brings a meticulous and thoughtful approach to the design and construction of each piece. Since 1947 we base our success on quality, research, and innovation. These, combined with our focus on customer care and optimization of materials, have given us the capabilities to expand internationally, owing to a strict observance of ethical and professional code. We are an industrial reality that promotes and values the heart of artisanship. The high quality of our products is obtained through an optimal combination of industrial technologies and artisan process. Our research and development team of experts have the perfect combination of knowledge, advanced technologies , and historical tradition values. Which allow us a unique position in the market. In our collections we have products which reflect different cultures and languages. We provide a wide series of natural stones, allowing our customers top quality and a great selection. Rosanna Lonsdale is an international luxury lighting business supplying lamps in Britain, Europe, America, the Caribbean, Asia and the Middle East. Rosanna Lonsdale designs and hand makes her lamps in London, following the same techniques used by her acclaimed grandmother, Monica Greig. Her extensive collection is customisable down to the last detail. Clients can choose bespoke background colours – matching their lamps perfectly to wallpapers and specific pantone colours, also choosing the metal finish and silk flex colour. Clients can also have the exclusive option of their own bespoke design on the lamps, featuring their initials/date or a particular motif. She also sells stunning lampshades that can be ordered in any size, including a silk ikat range perfect for adding a splash of colour. Founded by Victoria Rothschild and Mark Bickers in 2007, Rothschild & Bickers is renowned for its sophisticated and unique designs. Behind the exquisite lighting which adorns stylish hotels, restaurants and homes across the UK is a passion to keep the craft of glassblowing alive. Every design produced at the studio is handblown using traditional techniques, creating glass that will be cherished by future generations. The Royal School of Needlework (RSN) is the international centre of excellence for the art of hand embroidery. Founded in 1872, it is steeped in history with unrivalled expertise in this traditional craft. The RSN Embroidery Studio has customers from all over the world, from interior designers, architects and fashion designers to places of worship, private individuals and the Royal Family. The specialist team create beautiful bespoke commissions for the future as well as bring historical textiles back to life by conserving or restoring them. From large commissions, such as hand embroidering bespoke lace on to the iconic wedding dress of HRH The Duchess of Cambridge to smaller requests to conserve a precious sampler that has become a family heirloom, the highly trained, RSN expert stitchers use the finest hand embroidery techniques for each and every commission. It is an exciting time to be in the world of embroidery because there is scope to take it in many different directions.